NEW YORK, NY--(Marketwired - Jan 12, 2015) - CBX, the brand agency and retail design consultancy, was a big winner in the American Graphic Design Awards 2014, a 50-year-old national design competition conducted by the editors of Graphic Design USA. The firm won a total of six awards in the contest for environmental graphics, packaging and other touch points created on behalf of a wide range of clients. In the category of P-O-P, sign design, displays and environmental graphics, CBX won awards for the 'Super J' P-O-P display it developed for ASICS footwear and for the environmental graphics it created for RadioShack's new Sundance, Texas store. The environmental graphics were part of the striking prototype designs CBX developed for the chain's new and remodeled stores. The editors also recognized CBX for its packaging designs for Scotts Miracle-Gro's new Nature's Care product line as well as for the new line of LIQS pre-made cocktail shots. Finally, in the logo design category, CBX earned recognition for its work on behalf of Gamco Investors, a diversified global financial services company, and ReefGen, which sells premium ornamentals for aquariums. Viewable online at gdusa.com, the Getty Images-sponsored contest honors outstanding new work of all kinds, including print, packaging, point-of-purchase, Internet, interactive and motion graphics. Entrants include advertising agencies, graphic design firms, publishing departments and others from across the country. "As a firm of dedicated creatives who live and breathe our profession, we're extremely proud to receive this recognition," said Rick Barrack, Chief Creative Officer and co-founder of CBX. CBX specializes in creative marketing services including: branding, retail design, packaging and promotional programming. The company, with its current staff of more than 160 employees, was founded in 2003 and has a client base that includes: Dr Pepper Snapple Group, General Mills, Kimberly-Clark, Scotts Miracle-Gro, A&P, Pathmark, Saks Fifth Avenue, Lord & Taylor, Shinsegae, Walgreens and Wawa. In addition to its New York City Headquarters, CBX has offices in Minneapolis and San Francisco. CBX was named a "Design Firm of the Year" in Display & Design Ideas magazine's 2013 Portfolio Awards. 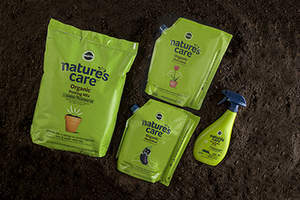 The American Graphic Design Awards honored CBX for its packaging design for Scotts Miracle-Gro's new Nature's Care product line.